In 1890 there was a transition between the “old navy” inherited from the secession war, and a “new navy” born from naval thinking, but not yet fuelled by ideas of imperialism like those professed by Alfred T Mahan. However the lack of experience in high seas battleships (the last one was the USS Dictator, a very large sea going monitor back in 1863) meant the US navy policy board started working in stages and in 1889 drawn a design for a coastal, or short range battleship, a bit similar to the units built by Germany at that time, or Scandinavian countries. 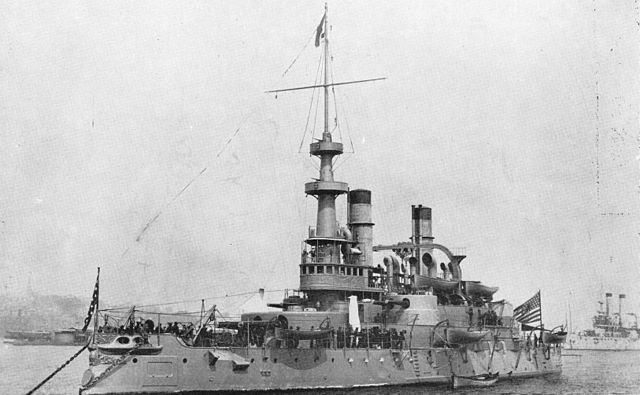 USS Indiana after 1898, in grey livery. 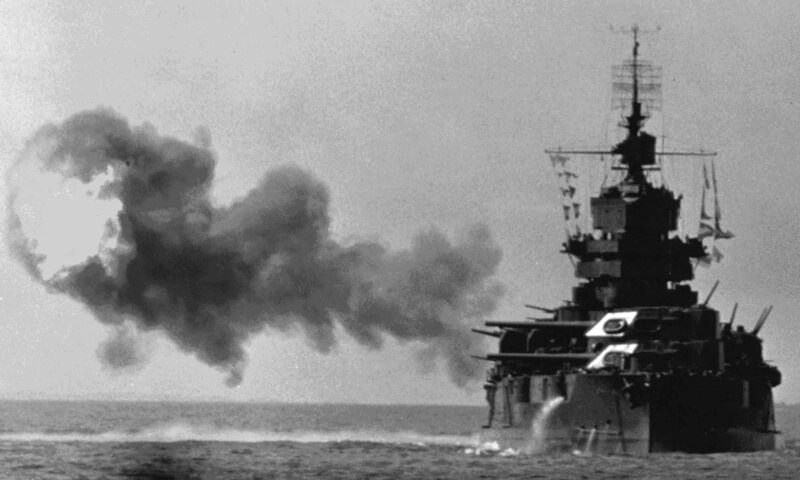 However, modest as it was this BB-1 (Battleship 1) was the very first piece of an ambitious naval construction plan, aiming at delivering 33 battleships and 167 smaller ships for the US Navy. 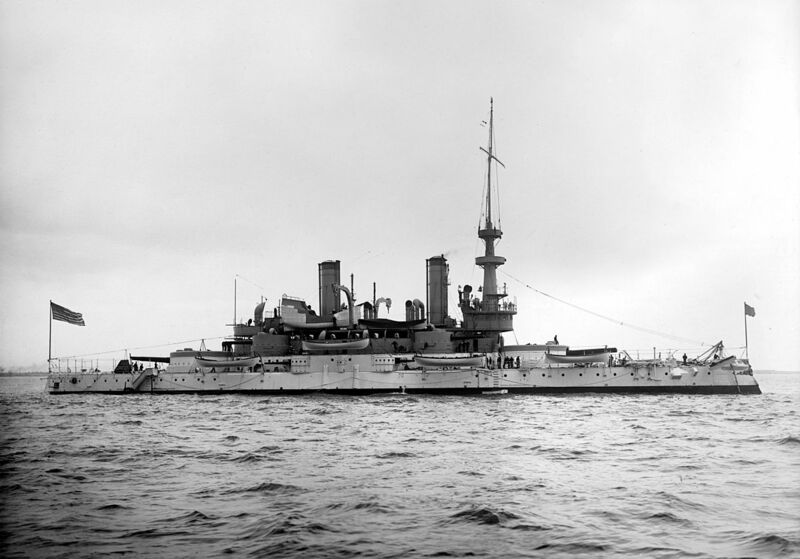 It was very much recognizing by the United States Congress as an attempt to end the isolationist policy ruling US foreign relations since the end of the civil war, and the design was refused this year, but accepted the next year the building of three coast defense battleships, of which the Indiana was the lead ship. This design was very much a measure to ease Congress vote rather than a design was really pleased the Navy. 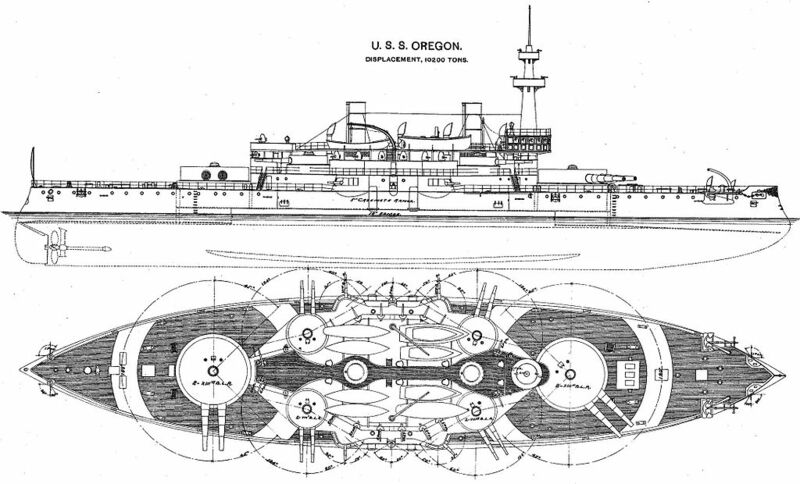 It was a compromise for moderate endurance, relatively small displacement and low freeboard but ended as a ship under-protected and under-armed compared to European equivalents and as Conways put it: “attempting too much on a very limited displacement.” The problem was two close copies were built. The 1890 order was passed on 30 June 1890 to William Cramp & Sons in Philadelphia for $3 million initially, but she costed $6 million in the end. In addition slow delivery of armour plates delayed the completion by one year and the ship was launched 28 February 1893 and completed for service on 20 November 1895, six years after the design was first drawn. The launching ceremony was an event, attended by 10,000 including President Benjamin Harrison, members of the congress and Indiana state representatives. Her sea trials began in March 1895, in ideal conditions for performances as side armor, guns, turrets and conning tower has not been installed yet. They really started in October. USS Indiana forecastle, showing the original heavy mast, later replace by a cage mast. 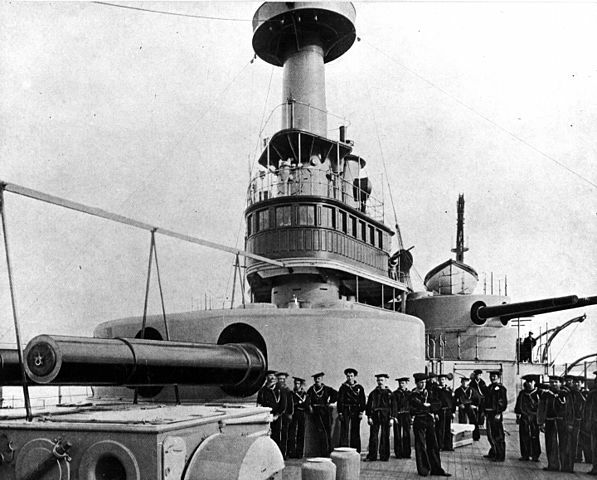 The Indiana was a typical pre-dreadnought design, with two main turrets fore and aft, a central island bristling with turrets, barbettes, and lighter guns under masks, a military mast and tall funnels. The hull emphasized lateral protection, had a spur and indeed a low freeboard which meant in the North Atlantic, a wet bridge at all times. 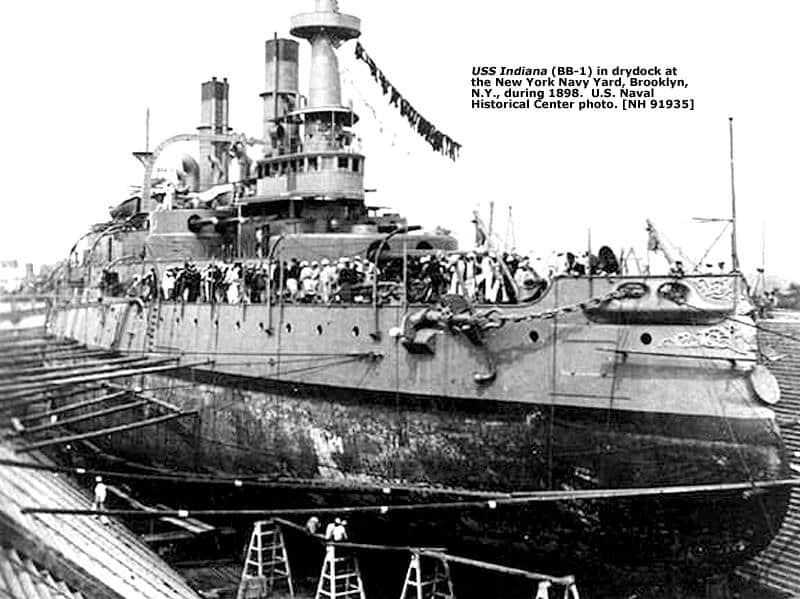 The USS Indiana displaced 10,288 long tons (10,453 t), for a Length of 350 ft 11 in (106.96 m) overall and 358 ft (109 m) at the waterline, a beam of 69 ft 3 in (21.11 m) and 27 ft (8.2 m) of draft. She was propelled by double ended Scotch boilers, two sets vertical inverted triple expansion reciprocating steam engines directing two shafts, for a top speed of 15 knots (28 km/h; 17 mph) and a 4,900 nmi (9,100 km; 5,600 mi) range. Her complement was 32 officers and 441 men. Indiana’s armament comprised two twin 13 in (330 mm)/35 caliber guns, four twin 8 in (203 mm)/35 cal guns, four 6 in (152 mm)/40 cal guns (removed 1908), twelve 3 in (76 mm)/50 cal guns (added 1910), twenty 6-pounder 57 mm (2.2 in) guns, six 1-pounder 37 mm (1.5 in) guns, and four 18 inch (450 mm) torpedo tubes. 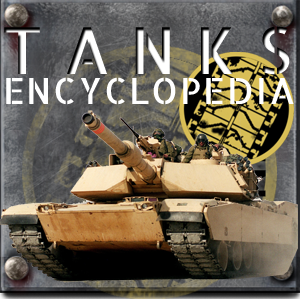 Protection was made of Harveyized steel with a belt 18–8.5 in (460–220 mm) strong, turrets 15 in (380 mm) thick, 5 in (130 mm) on the hull. Conventional nickel-steel was also used on the conning tower (10 in (250 mm)), secondary turrets (6 in (150 mm)) and the deck: 3 in (76 mm). USS Massachusetts was laid sown also at William Cramp and Sons, in the second slip, one month later Indiana in June 1891. She was launched 10 June 1893 and completed 10 June 1896, the delay being the delivery of armor plates. The two were very close (same blueprints) and at the exterior, only the funnel’s height betrayed these. An interesting fact was the belt armor design was based on the designed draft, 24 feet (7.3 m) with a normal load of 400 long tons of coal on board. However it appeared that with additional weight and coal this would increase to 27 feet (8.2 m), submerging the armor belt, making it useless. The load of coal was taken in consideration in the next Illinois design by Walker policy board. The two ships had the same engine room but eight Babcock boilers including four superheaters were added in 1907 to replace older Scotch models on Massachusetts. She had a top speed of 16.2 kn (30.0 km/h; 18.6 mph) with 10,400 ihp (7,800 kW) while USS Oregon reached 16.8 kn (31.1 km/h; 19.3 mph) with 11,000 ihp (8,200 kW). USS Oregon was laid down at Union Iron Works on 19 November 1891, launched in 26 October 1893 and completed 16 July 1896. 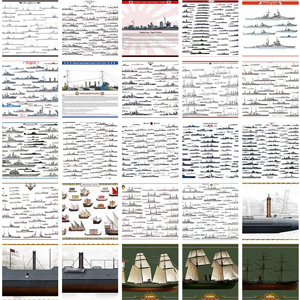 All three battleships were the rare ones to see action in two wars, 1898 and 1917-18, separated by almost the same gap as ww1 and ww2. The war of 1898 was almost the last “romantic” war, full of dashing and bravado over, easy victory of a young nation over a crumbling old empire. 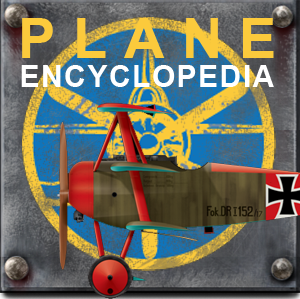 Due to their very design, their contribution to the war effort in 1917-18 was limited. There is nothing notable before the Spanish-American war in 1898 (see details of the battle of Santiago de Cuba). She was then flagship of the North Atlantic Squadron, bearing the colors of Rear Admiral William T. Sampson. She raided the port of San Juan, bombarding it, before rallying Commodore Schley’s Flying Squadron which had found Cervera in Santiago. She arrived two days later but did not chased Cervera as being in the extreme eastern position. However she later catch destroyers Pluton and Furor when they emerged from the entrance and destroyed them. From 1899 to 1903 she alternated training exercises with the fleet before being decommissioned after a career less than 8 years. She was recommissioned three years later as dedicated training ship, having just received new modern boilers, and a cage mast replacing her ancient heavy mast. She was against decommissioned in 1914, and reactivated in 1917, for gunners training. On 31 January 1919 came her final decommission, her name being passed to BB-50 while she was renamed Coast Battleship Number 1. She ended in shallow water as a torpedo target and aerial bombing tests ship in November 1920 and her remains were refloated and sold for scrap in 1924. 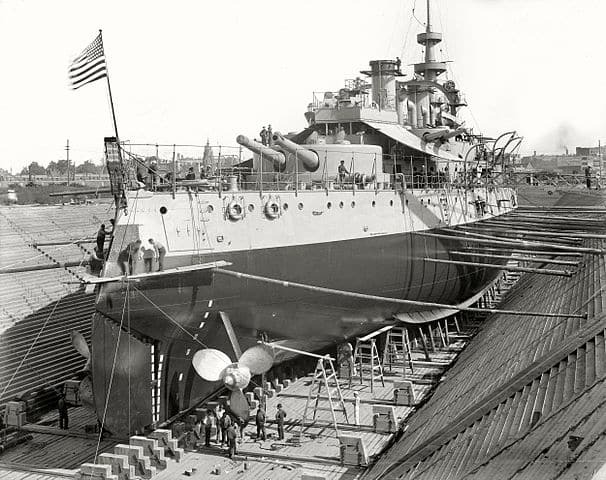 USS Indiana in Drydock, 1898. She conducted training exercises on the eastern coast soon after completion, and in 1898 was placed in the Flying Squadron under Commodore Winfield Scott Schley. She blockaded the port of Santiago but was missing when the battle started, as she was back to Guantánamo Bay in the night to resupply. 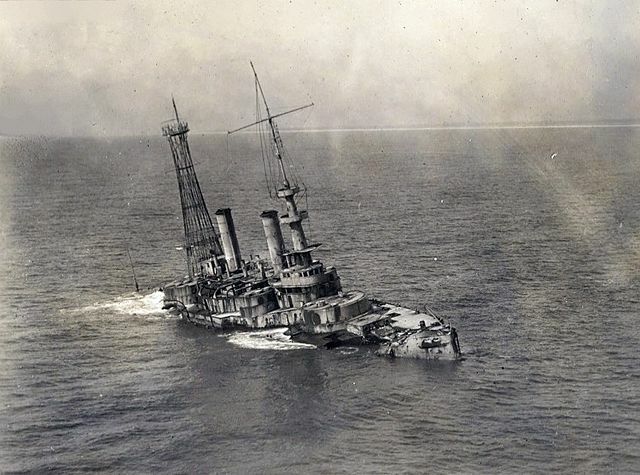 She joined Texas which was shelling the Spanish cruiser Reina Mercedes, scuttled to block the entrance. After the war she spent her career with the North Atlantic squadron, patrolling the Atlantic coast and eastern Caribbean. Before her decommission she was used as a training ship for Naval Academy midshipmen in 1906. She received new boilers and a cage mast, and was back as a “reduced commission” training ship in May 1910. She then joined the Atlantic Reserve Fleet in September 1912, was decommissioned in May 1914, then back again in June 1917 as a gunner training ship. Decomm. again 31 March 1919, renamed Coast Battleship Number 2, scuttle in 1921 off the coast of pensacola, sunk as an artillery target for Fort Pickens. However as her hulk found no buyer she layed there as an artificial reef since then. Now a diver’s attraction and property of the state of Florida (Florida Underwater Archaeological Preserves). She joined the Pacific Station after a voyage around South America to the East Coast in March 1898 (in preparation for war with Spain), covering 14,000 nautical miles in just 66 days. The press noted the feat buy also found it a great argument against any opponents to the completion of the Panama Canal. However she was back in North Atlantic Squadron under Rear Admiral Sampson, taking part in the Battle of Santiago de Cuba and chasing together with the cruiser Brooklyn the Spanish Cruiser Colon. She earned the nickname “Bulldog of the Navy” because of her ploughing bow, in marine slang “having a bone in her teeth”. She was afterwards refitted in New York City, then returned to the pacific, served a year in the Philippine–American War, then joined China, Wusong during the Boxer Rebellion (May 1901) and returned to drydock in the USA for an overhaul. She was back in the pacific in March 1903, was decommissioned from April 1906 to August 1911, and was placed into reserved in 1914. In January 1915 she was back in service, joining San Francisco for the Panama–Pacific International Exposition, then replaced in reserve. She was eventually recommissioned for the last time in April 1917, and escorted transport ships during the Siberian Intervention. She also was a reviewing ship for President Woodrow Wilson (Pacific Fleet at Seattle) and was retired for good in October 1919 and was transferred in 1925 to State of Oregon, starting a life of war memorial. However in 1941 given her scrap value she was sold as IX-22 and partly recycled. Her stripped hulk served as a supply barge at Guam, but in 1948 because of a typhoon, broke loose, drifted away and was recovered and resold 15 March 1956 in a shipbreaker in Japan. 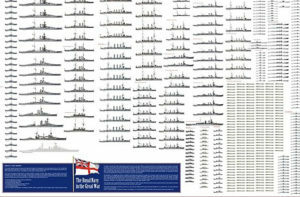 Conway’s all the world fighting ships 1860-1905 and 1906-1921.